This Roman shield is the highest quality of all of our Roman shields. It is perfect for Roman soldiers, Roman Centurion officers, or Gladiator costumes. 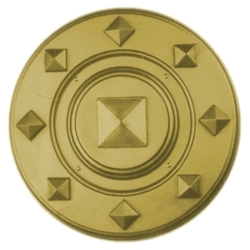 Don’t forget to check out the rest of our Roman and Gladiator costume accessories to go along with this shield. The Roman shield is made of a thick plastic with an attached handle and measures 16” in diameter.